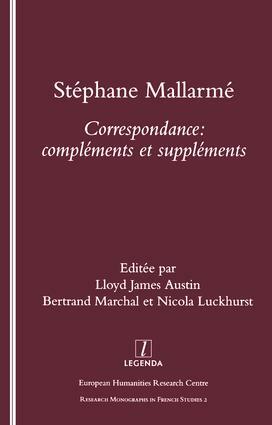 This collection of Stephane Mallarme's letters is an indispensable companion to the 'complete' correspondence published by Gallimard in eleven volumes (1959-85). The collection comprises 143 letters, dating from 1863 to 1898. Many are previously unpublished, others are published in their entirety for the first time. Not only is the life and work of the poet revealed through his letter writing, but Austin's editorial notes also include the replies of Mallarme's editors and fellow writers. A vivid dialogue emerges between the poet and his contemporaries.